It's not clear where the Lawford family originated, but it seems probable that some of them either took their name from or gave their name to the villages of Church Lawford and Long Lawford near Rugby. There is also a village called Lawford near Manningtree in Essex, with a fine church and large house - Lawford Hall - overlooking the River Stour which used to have the Lawford coat of arms over the door*. Both Church Lawford and Lawford in Essex are named in the Domesday Book, so it is likely that a family of that name existed well before 1086 when it was compiled. Some reflections on the family's connection with both Rugby and Maningtree appear here. There is also a note here from the Internet Surname Database that has some further unchecked details. The family tree drawn up by Reginald Ames in the 1880s shows the lineage back to Robert Lawford (1581 - 1641) of Co Warwick, Gent, after of Stoke Gifford, Co Gloucester who died in Bristol. One of his sons, John Lawford (1609-1688) was mayor of Bristol in 1664 and 'Lord of the Manor of Tockington' in Co Gloucester, so we should conclude that the family was well-established by the 17th Century. By the second half of the C18th and the C19th, Lawfords were mostly bankers, lawyers and soldiers - and in common with many families with strong connections with the City of London, became associated with one of the Livery Companies. As a result, Lawfords have been Liverymen of the Drapers' Company since the 1700s, and Valentine Lawford (1709-1783) became the first Lawford Master in 1775. Neither my father Patrick nor his father Capt VA Lawford were liverymen and it was not until I was looking through Uncle Valentine's papers in the 1980s that I noticed the connection, and was admitted to the Livery in 1988. By then, no less than six Lawfords had become Master, as well as others who were married to Lawford women. My great-great-great grandfather Samuel Lawford (1749-1835) and great-great grandfather, also called Samuel (1777-1864), were Masters in 1809 and 1850 respectively. In addition, his son (and my great-grandfather) John Lawford (1790-1875) was a solicitor and became Junior Warden in 1871 but died before he could become Master. The full list can be found in a longer note about the Drapers' Livery Company here, compiled by a cousin, Nigel Lawford. Indeed, several Lawfords served the Drapers as Clerk and Solicitor including Edward, who was also Solicitor to the East India Company. 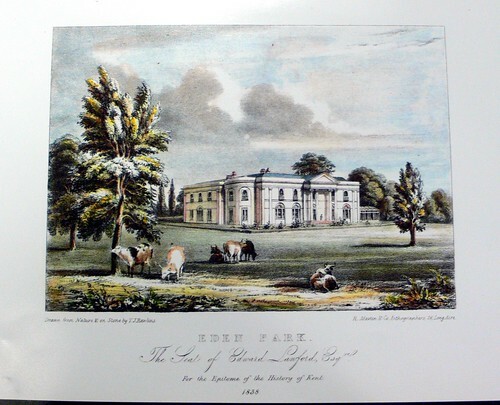 Paintings of Edward's house - Eden Park, in Kent remain. John Lawford, incidentally, was the brother of Thomas Acland Lawford, father of General Sir Sydney Lawford, who's son Peter became a well known actor and married one of JF Kennedy's sisters. The youngest of Thomas Acland Lawford's thee brothers was Herbert Lawford (HF Lawford), who was the Wimbledon tennis champion in 1887. Great-great grandfather Samuel Lawford's son Maj-General Edward Lawford (1809-1871) was Chief Engineer, Mysore in the 1860s and his younger brother, Lt-Col Henry (1812-1880) also served in Madras. Likewise the sons of Edward Lawford (of the East India Company and Eden Park), Maj-General Edward Melville Lawford (1826-1891) was Colonel of the 4th Madras Cavalry, while his younger brother, Henry Baring Lawford was Chief Judge of the High Court of Kishnagur. Photos of the Lawfords descended from Edward Lawford (of Eden Park) can be seen here. My great grandfather John Lawford (1811 - 1875), was a banker, as was his father Samuel before him. They both worked at Curries & Co and John appears to have lived for a large part of his life at the bank's premises at 29 Cornhill. His first four children were born there and according to Uncle Valentine, his daughter Sophie's nursery windows looked out over the Royal Exchange. Later he lived in Blackheath, where the rest of his twelve children were born. My grandfather Capt Vincent Lawford RN CMG DSO served under Jellicoe at the Battle of Jutland. 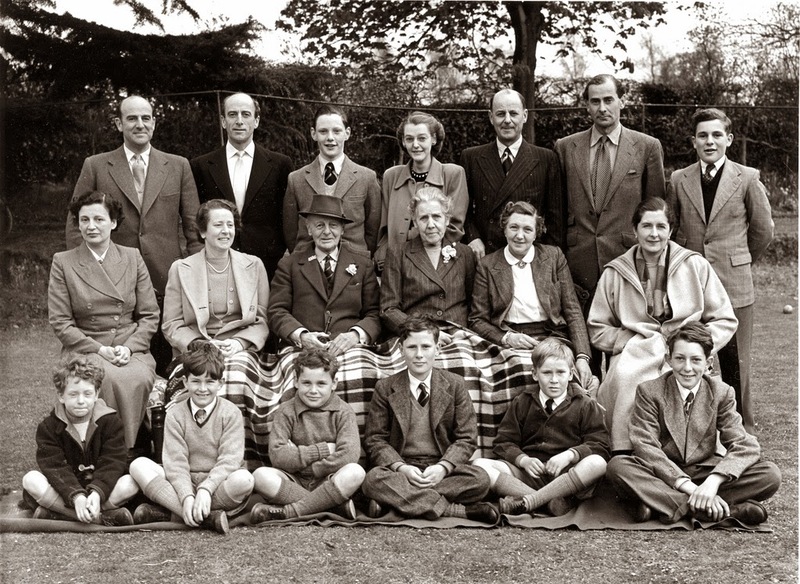 ** A photo of him and his wife Jane (nee Mapplebeck) at their Golden wedding in 1953 surrounded by their children and grandchildren can be seen here. A fuller note can be seen here. My father Patrick's brief biography can be seen here. My uncle Valentine Lawford did a great deal of work on the family history (as well as living a most interesting and eventful life himself). His papers survive and are maintained by my cousin Jeremy Lawford, while another cousin (though Jane's family), Charles Tilbury, has placed his diaries in the Churchill Library. * Lawford Hall was built in the 1780s, but cannot be reliably traced to our line of Lawfords except for the fact that it bears the family coat of arms. They used to be over the main door, but have now been moved inside due to rainwater problems. ** Capt John Lawford (later Admiral Sir John) was in 1794 acquitted in a court marshal known as the 'Wreck of the Ten Sail' and commanded a ship of the line under Nelson in the Battle of Copenhagen. but his link with our family line is uncertain. Warships named 'HMS Lawford' (named after Admiral Sir John whose sword is in the National Maritime Museum) were sunk in both 1917 and 1944, the latter bearing silver donated by the family. It is wonderful to see your family archive, which I hit upon in my search to know more on Edward Lawford the East India Company solicitor. I came across his name in my study of an interesting legal wrangling between the Company and an iron company, called Indian Iron company in the mid-1840s. The iron company had disputed the interpretation of some clauses in their deeds with the Hon'ble Company whence Edward's opinion was sought. I was verily impressed by Edward's astute and clever opinion. There seems to be some truth in the 'wickedness' of Uncle Edward! Thanks again for sharing your wonderful family archive. Will always be grateful to more about teh Lawford's connection with the Company.